Fox News seemed unfazed by the Bureau of Labor Statistics’ (BLS) estimate that the economy lost 33,000 jobs last month -- a figure far short of most economist’s expectations. The network’s rosy interpretation of an aberrant monthly jobs report stands in stark contrast to years of nitpicking and misrepresentation during the Obama administration, and it reveals once again that Fox is working to prop up President Donald Trump. According to the BLS’ monthly employment report for September 2017, the economy lost 33,000 jobs last month while the unemployment rate fell to 4.2 percent. Job creation for the months of July and August was revised down by a combined 38,000, meaning that the average pace of job creation over the past three months fell to just 91,000. According to a BLS statement, part of the job loss in September was the result of hurricanes Harvey and Irma, which may have disrupted data collection and likely prevented some businesses from hiring. The storms devastated parts of Texas and Florida and are expected to exert downward pressure, at least temporarily, on the overall economy. 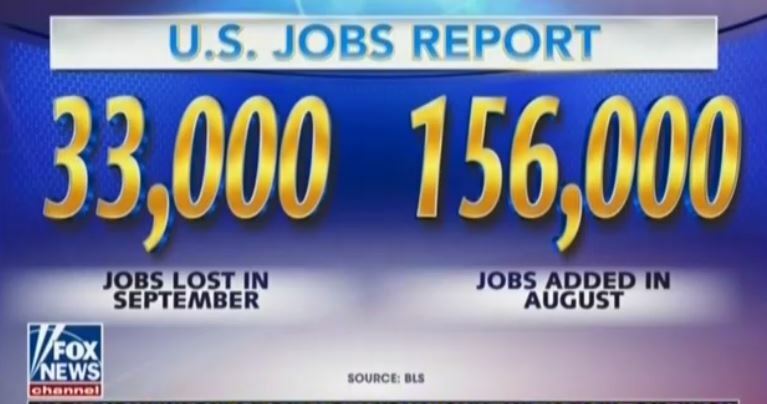 During the Obama administration, the team at Fox News would have pounced on a jobs report with such a stark negative jobs number. 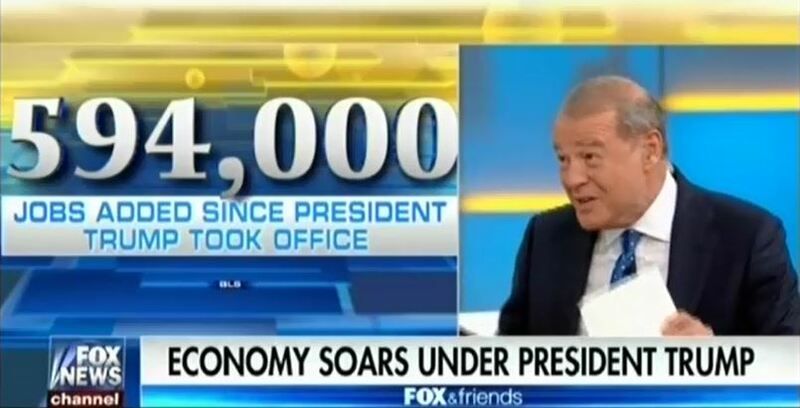 Indeed, when the jobs figure from December 2016 merely came in under expectations, Fox claimed it was proof that the Obama economy was sputtering and “sick.” Fox completely reversed the tone of its economic coverage after Trump’s inauguration, and that reversal was on full display this morning. Fox News used the Bureau of Labor Statistics’ (BLS) underwhelming jobs report for the month of May as proof that Congress needs to pass President Donald Trump’s trickle-down economic agenda that, in reality, would strip working- and middle-class Americans of basic public services and hand top income earners a gigantic tax cut. On June 2, BLS released its jobs report for May 2017, which estimated the United States added 138,000 new jobs last month while the unemployment rate fell slightly to 4.3 percent. The jobs number fell below economists’ expectations and The Washington Post declared that the report showed that the “job market stumble[d]” last month. While the number of new jobs reported was weaker than expected, The New York Times noted the overall health of the economy was still strong enough for the Federal Reserve to possibly raise interest rates and pointed out that wage growth was up 2.5 percent from this time last year. In reality, Trump’s economic agenda has been described as a “repugnant grab bag” of tax cuts for top-income earners that guts funds for Medicaid, children’s health insurance, food assistance, medical research, disease prevention funding, disability insurance, and even college student financial aid while watering down consumer protections to give Wall Street investors a $100 billion windfall. Trump’s budget proposal to slash funding for vital health assistance programs has been described as “ruthless” and would exact a huge human cost from those who lose access to care. Fox figures have attempted to use the monthly jobs report to advance the president’s agenda since he first took office. Fox used the reports to claim unearned victories for the president, and even once used a jobs report described as “weak” to declare it was “the most successful day” of Trump’s presidency. Last month, a Fox Business panel attempted to spin the April jobs report as a reason to pursue Trump’s tax and regulatory policies with no evidence to back up its claims. Next month will likely produce more of the same. MSNBC's Ali Velshi: "Presidents Get Altogether Too Much Credit And Blame For Jobs Numbers"
Right-wing media reacted with predictable enthusiasm to a better-than-expected February 2017 jobs report from the Bureau of Labor Statistics (BLS), which they attributed to President Donald Trump’s unique leadership. In reality, the economy is currently enjoying a 77-month streak of job creation that began under President Barack Obama -- whom the same outlets routinely blasted for leading a sluggish economic recovery. On March 10, the BLS released its monthly jobs report for February 2017 showing that the economy added approximately 235,000 jobs last month and the unemployment rate remained little changed at 4.7 percent. After accounting for minor upward revisions to data from December and January, the economy has produced an average of 209,000 jobs per month over the past three months. Today’s jobs report, which showed the economy adding 235,000 jobs in February, is notable for being the first BLS report of the Trump administration. It may be tempting for today’s policymakers to claim credit for this solid employment growth, but credit is only truly deserved when the economy grows faster than expected. It’s important to remember that President Trump inherited an economy that was already making steady progress towards full employment. The jobs data are certainly strong -- and they undermine Trump’s claim that he inherited a “mess” from his predecessor -- but not everything in the report was good news. Bloomberg financial columnist Conor Sen pointed out that the February report showed a drop in employment for workers without a high school diploma, and University of Michigan economist Betsey Stevenson noted that labor force participation for men actually declined slightly while participation rates for women increased. Media Matters pointed out last month how quickly Fox News had shifted from nitpicking the jobs reports to lauding them after Trump’s inauguration -- so quickly, in fact, that the network incorrectly credited a January expansion to the new president. New York Times reporter Sopan Deb mocked Trump and his right-wing allies for suddenly embracing positive jobs data that they spread conspiracy theories about just months ago, while New York magazine writer Jonathan Chait questioned why no outlets were reporting the more than 90 million people who are currently out of the labor market -- a favorite right-wing media misrepresentation during the Obama administration. As FiveThirtyEight chief economic writer Ben Casselman pointed out, no president deserves singular credit for monthly job creation in the vast American economy. Apparently The Jobs Report Is No Longer A Massive Conspiracy? President Donald Trump immediately retweeted right-wing media praise for a strong February 2017 jobs report from the Bureau of Labor Statistics (BLS), which showed above-average job creation and a steady unemployment rate last month. Trump’s willingness to embrace the BLS monthly jobs report is at odds with his past approach -- at least over the last four years -- of slamming the number as “phony” and as merely a political tool of the Obama administration. Unfortunately for Fox’s pro-Trump narrative, the job creation in this report does not belong to his administration. University of Chicago economist Austan Goolsbee, a former chairman of President Obama's Council of Economic Advisors, pointed out that the "reference week" for the latest jobs data ran through January 12, meaning the entire report predates the Trump administration by over a week. Washington Post reporter Glenn Kessler, who runs the paper's fact-checking research, also noted that the report "still reflects the Obama administration.” Fox also neglected to mention that the report marks 76 consecutive months of job growth -- the longest on record -- for Obama. The positive coverage of the report is a complete turnaround for Fox, which went to great lengths to portray strong jobs reports in a negative light during the Obama administration. In February 2015, the economy added 257,000 new jobs, but Fox was concerned that the unemployment rate ticked up by 0.1 points -- the same increase the rate showed in today’s report. In October of that year, Fox & Friends stumbled through a news alert in which a host claimed the economy created “only 271,000 jobs … last month” even though that report, like the data released today, also beat expectations. Last January, Fox’s spin was to claim that 292,000 new jobs was “modest by historical standards,” though it was well over this month’s 227,000. And in April 2016 the network parsed the jobs data to conclude that a report showing 215,000 new jobs was unimpressive because 47,000 of those were allegedly low-quality retail positions -- yet Nauert made no such comment about the 46,000 retail jobs included in today’s report. As Election Day drew near, Fox & Friends falsely claimed that steady jobs data for October 2016 were “underwhelming” and spun the news as a boon for Trump’s presidential candidacy.